Operation Support Our Troops, INC.
Operation Support Our Troops, Inc. was founded to help improve the morale and welfare of members of the armed forces of the United States of America deployed in harm's way. We accomplish our mission by sending care packages — a touch, a taste and a smell of home — as well as personal messages of support, and items that are not readily available to our troops in their deployed locations. 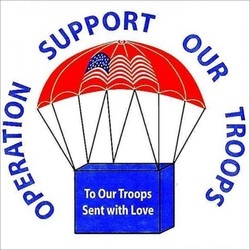 Operation Support Our Troops, Inc. also supports our wounded service members. The first stop for our wounded soldiers is at Landstuhl Regional Medical Center in Germany. We support them there and continue that support as they journey toward recovery at military installations in the United States. Our mission is to support our armed forces, wherever they may be and in whatever way possible, so that they can focus on the mission at hand and return safely to loved ones when their job is done. OSOT, Inc. has a 501 (c)(3) status. 98.5% of donations are directly given back to soldiers.